High-Stakes, Low-Wager – What’s Your Label? Are you, like many of us, the one that wanders through the grocery store reading the nutrition label before you put the extra crunchy peanut butter in your shopping cart? Do you question if that organic low-fat, medium carb, almond milk really as healthy as it says it is? With so much choice, how do we know what is what, and how can we be sure we’ll like what we choose? By reading the label. In 2017, the new PlaySmart Slots Classification pilot project was launched at OLG Slots at Grand River Raceway. 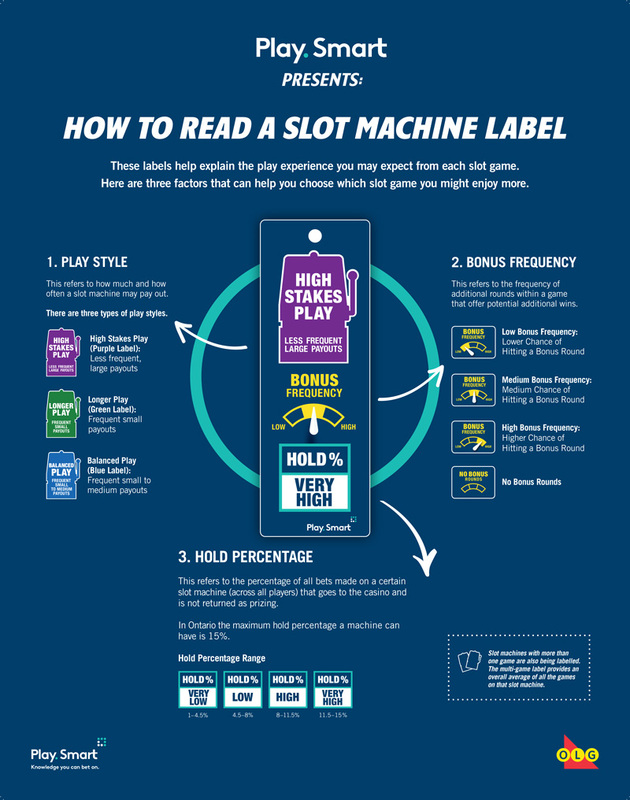 This project, the first of its kind worldwide, uses labels on slot machines to educate players about the differences between each machines’ key features, helping you to know which ones fit your preferred style of play. Here is a breakdown of the different slot machine categories. There are three types of play styles. The frequency of additional rounds within a game that offer potential additional wins. But remember just because a machine has bonus rounds it doesn’t mean you are guaranteed a win on them. This refers to the percentage of all bets made on a certain slot machine (across all players) that goes to the casino and is not returned as prizing. The hold percentage doesn’t change per play cycle; it’s a pre-determined amount. In Ontario the maximum hold percentage a machine can have is 15%. This means that up to 85% of all bets made across all players, on a specific machine, can be won in prizing. Why did we create these labels? To improve your play experience. Now whether you prefer a quick round of high stakes play, or are the type to stretch your buck over more hours with smaller wagers, you can choose the game that best suits you. It’s all about giving you the knowledge to make your slot experience more fun!